What’s a wild idea? Have you ever thought of something crazy to do? 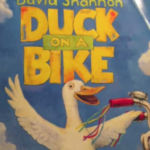 In our story this week, Duck on a Bike by David Shannon Click Here, a duck defies odds and rides a bike. We will learn new vocabulary (wild idea, wobble, streamers, confidence, show off) and talk about being kind to others who are learning new things. We will label characters and setting and make predictions. When reading this with your child, talk about the reaction/feelings of each of the characters (cow: crazy, sheep: worried, chicken: scared etc). What did they learn from duck once they each rode a bike? (that it was a good idea). Sometimes things look scary to us but if we have confidence (our brain telling us we CAN), most times we can accomplish what we set out to do. Why not take your child on a bike ride this week! Make some streamers and tie them onto the handles of your bike. Watch how they change as you speed up! Talk about the things you see along the way. When you get home, try to remember the things and recall them out loud (this is great for building short term memory skills). Language Extensions At Home is on the right with our new sound for the Surprise bags.